May 2015 - The BAScontrol22 Unitary Controller is a good example of an open controller in that it embodies the attributes of an open controller as defined by Contemporary Controls. 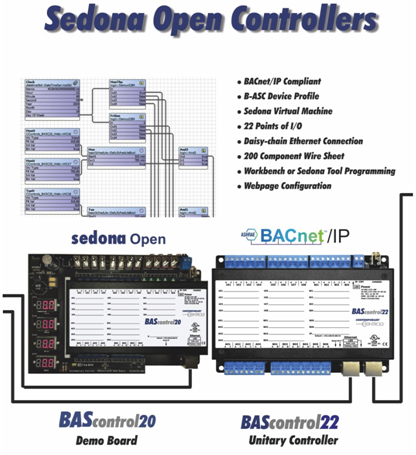 It is BACnet/IP compliant and incorporates a Sedona Virtual Machine. It can be programmed using Niagara Workbench or with a Sedona Tool. It is available to any systems integrator without restriction. The BAScontrol20 Demo Board is ideal for training and simulation by having inputs and outputs pre-wired to physical points. Applications can be tested before being deployed in the field.